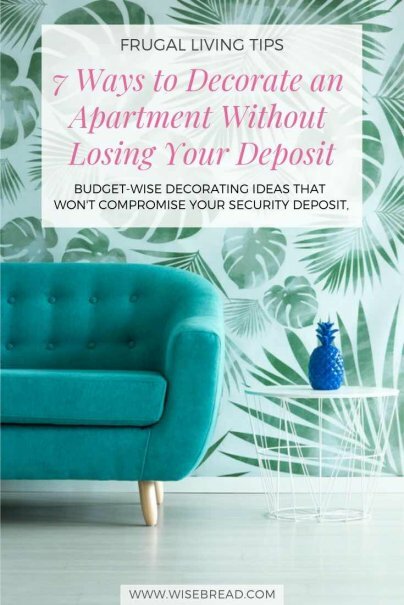 It can be a challenge putting your own personal touches on a rental apartment, but with these budget-wise decorating ideas that won't compromise your security deposit, you'll start to feel at home in no time. I love the idea of an accent wall featuring wallpaper or some sort of design to give a room more personality. But how can you achieve this look without the permanence or expense of wallpaper? Modern décor has become so DIY these days that you can, in fact, install removable wallpaper — essentially stick-on paper that you apply in minutes and simply peel off when you want to take it down — or spot-design using decals. I've done the latter myself. I created a birds-in-flight effect on three accent walls in my house that give my living room a great amount of detail and depth, and it cost me less than $30 total. "With washi tape, you can create your own designs and bring texture to the space. These can be easily removed from the walls," she says. I can tell you from personal experience that one of the easiest, most inexpensive ways to freshen up a space is to change hardware. For instance, when I moved into my home, I wanted to completely overhaul the bathroom, but I didn't have the budget for it. Instead, I compromised by updating the towel racks, TP holder, light fixture, and other bits with brushed nickel accessories that instantly gave the room a cleaner, fresher look. Same goes for the kitchen. Instead of ripping out the cabinets because I didn't like the style, I changed all the handles and knobs to suit my taste, and it made a major difference. You can do this in your apartment, too, without losing your deposit, by replacing the old hardware before you move out. Just keep the original hardware handy and in a safe place. If you live in a small apartment, you know all too well that what once looked like a lot of space when the unit was empty, may very well look (and feel) cramped once your furniture and belongings are all moved in. Well-placed mirrors, however, can seemingly expand the space, providing the illusion of more room. "When dealing with a small space, illusions are your best bet to fool yourself — and, more importantly, your guests — that you have more space," says Adam Busch, head of renter outreach for apartment-finding site RentLingo. He suggests incorporating a mirror into your living room to create more space. "Utilizing the height of your room changes the appearance as well and one of the best ways to do this is to use taller curtains to create a larger height dimension," he says. If you don't want to (or can't) paint an entire room for fear of losing your deposit, perhaps your landlord will consider an accent wall. Or maybe you don't even have to tell them about it. That's the great thing about an accent wall — you're not covering a lot of territory, but it can make a world of difference in the overall aesthetic of the room. To take this concept a bit further, consider creating a pattern with the paint instead of applying a single straight color. "The benefit of this feature is that instead of covering an entire wall with paint and the added stress of having to repaint the entire wall before you leave, you make use of a smaller space but add complexity for flair," Busch says. Many renters will likely agree that most of the time the reason their security deposit is in jeopardy is due to the state of the walls — that is, the nail and other holes that have accumulated over the period of your tenure. To avoid this deal-breaker, try using wall putty to hang lighter items, like prints, posters, and small canvases. Stay away from hanging glass items with putty, however, because if the putty fails, you don't want to have that dangerous mess to clean up. 3M's Command line has lots of solutions that help you hang items with heavier-duty adhesives, and you can find these products at any hardware or office supply store, and even more common retailers like Walmart and Target. Aside from replacing hardware in your kitchen to freshen up the space, another great redesign tactic you can implement is to use faux granite and/or stainless steel to wrap countertops and appliances. The concept is similar to removable wallpaper. Peel and stick the vinyl covering on the smooth surface you're trying to change, and voila; instant makeover without the hassle, cost, or loss of deposit. I'll admit that I hadn't actually heard of this cool trick before I started researching this post, but from what I can tell it definitely seems like a legit way to modernize otherwise out-of-date kitchen focal points without getting in too deep. And, finally, if you don't want to do anything to the wall, appliances, or hardware in your apartment, remember that you can use textiles to make your space cozy and comfortable. "Pillows and rugs can be affordable and helps dress up a plain apartment; you just need to know where to shop for these items," Choo explains. "You can get a set of stylish pillows for $25 and under online on sites such as Target." Expanding on that, area rugs, throws, and interesting upholstered furniture can all add that little something extra to your apartment without costing you any deductions from your deposit on the backend. What are some of your budget-wise ways to dress up an apartment without compromising or losing the deposit? I'd love to hear your thoughts in the comments below.